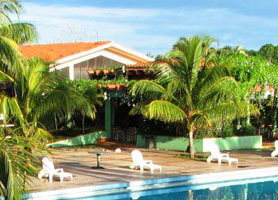 Hotel Las Yagrumas Havana is the ideal hotel for those who love nature and the great outdoors. Situated on the banks of the Ariguanabo River and surrounded by lush tropical vegetation, the Hotel Las Yagrumas Havana tempts its gets to discover this rural setting and Havana’s beautiful countryside. Just 14 miles (22 kilometers) from the center of Havana, and just 6km from the Jose Marti International airport, this hotel would also be ideal for those with a flight stop over or flight delay in Havana. The Hotel Las Yagrumas Havana’s natural setting wins the hearts and minds of visitors, many of whom return to its tranquility to relax after a hectic stay in one of Havanas central hotels. It’s a perfect place to unwind and relax while discovering the tiny village of San Antonio de los Baños to experience Cuban life as most Cubans live. 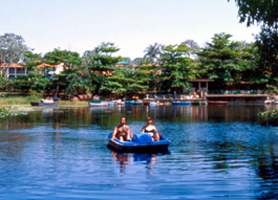 The small lake adjacent to the hotel offers peddle-boats for guests while the pool is a reasonable size for swimming. The Las Yagrumas hiking Trail is also one of the reasons why the hotel is so popular when it is used as a base from which avid hikers depart. 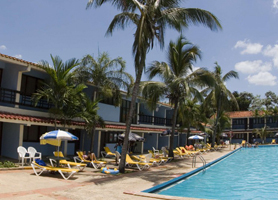 Hotel Las Yagrumas Havana is also extremely popular with bird watchers who come from around the world to see Cuban birds fauna like; Mockingbirds, Emerald Hummingbirds and royal palm trees. The Ariguanabo River next to the Hotel Las Yagrumas Havana is a slow running and extremely clean river, ideal for swimming or just relaxing along its banks. 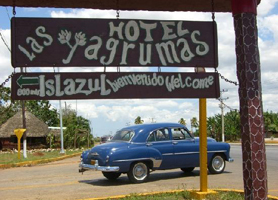 Hotel Las Yagrumas Havana is sometimes in high demand and, as such, should be booked in advance. Our booking program allows reservations at Hotel Las Yagrumas without down payment or deposit which will guarantee your dates and also allows preferential modifications should your dates change in the future. Our booking process is unique because it shows the best rate from all of these for Hotel Las Yagrumas in Havana Cuba and the types of rooms available. 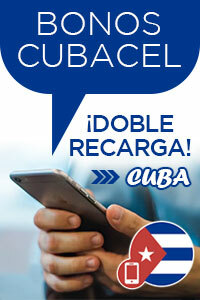 Our Hotel Las Yagrumas Havana rate comparison is an industry first for Cuban Hotels. Once you’ve compared the rates, finalizing the booking at Hotel Las Yagrumas takes just seconds and an immediate confirmation is provided in real-time.